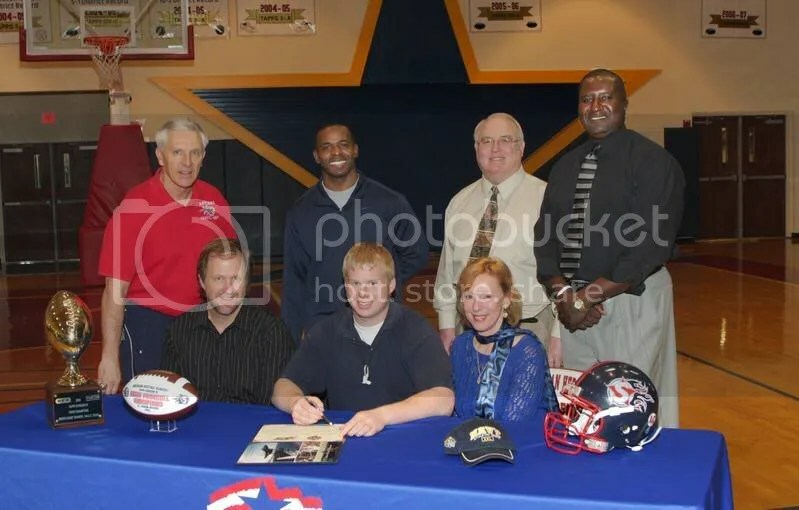 Kyle Widhalm from American Heritage Academy has signed a letter of intent to attend the US Naval Academy. Kyle is the son of Chuck & Carol Widhalm of Fairview, Texas. While at Carrollton’s American Heritage Academy, Kyle has distinguished himself as a top academic student athlete. Along with football he is an outstanding shot putter and discus thrower in Track. Kyle made All District, All State and was a member of the North “Blue” DFW All Private School All Star Football Team. “Kyle Widhalm is one of the best offensive and defensive lineman we have had in 10 years of AHA football which includes many outstanding players”, says Bob Giesey. “There has been no football player at AHA every work harder and been more of a team player than Kyle Widhalm”. Kyle is a superior student and top citizen and I predict someday he will captain the Navy team. He was the “rock” of our championship team this past season and he will be hard to replace”. Robert McAllister and Charles Carter were his coaches this past season and as they have said on more than one occasion, “it’s a pleasure to be with Kyle every day”. Kyle is a tremendous leader and role model for our young players and it is our hope his legacy will continue with other players both on and off the field.